It is now a year since the Natural Environment Research Council (NERC) announced the results of its first competition for ‘Doctoral Training Partnerships (DTP)’, and just a few weeks since each of the 15 funded DTPs welcomed their first cohorts of doctoral students. In this time, the training landscape for PhD (or DPhil) students across the environmental sciences has changed radically. Since we are approaching the annual round of applications for doctoral study, this post offers a short summary and perspective on ‘how to apply for doctoral study‘ which should be relevant across the UK, and for most students looking for projects that will fall under NERC’s broad ‘environmental science’ remit. – if you are not a UK resident, but are from the EU then you should be eligible for a fees-only award, and will to find some other sources of funding to pay for living costs. All universities will have scholarship packages for this purpose, so do ask! – if you are an international student, from outside the EU, then the NERC rules are clear that you cannot be funded by a NERC training grant. However, the quality of the UK research base relies on attracting an exceptional pool of talented graduate students from around the world – and all universities will have competitive scholarship packages to support graduate study in the UK. In addition to these 240 studentships, NERC also support a number of Centres for Doctoral Training, and some stand-alone industrial ‘CASE’ studentships. The fifteen Doctoral Training Partnerships all offer tailored training in research and related skills, but the details of the training offered (both in terms of what is offered, what is required, and the timing of the training courses) will be different from one DTP to the next. All DTPs share the ambition of providing a programme of activities that will help students as they initiate, develop and complete their research projects, and embark on their careers – whether in science, or beyond. All of the DTPs are also partnerships – with ambitions to engage in research and related activities with partner organisations from outside the Higher Education sector. By the same token, the DTPs all have different mechanisms in place to match up potential students with research topics, and supervisors: some will advertise lists of approved topics from the outset, while others may have no formal project lists but simply encourage applicants to apply for broad research areas of interest; or to work with particular reserchers, or research groups. My advice – don’t be passive, but make contact with the DTPs and potential supervisors, and start up a conversation well before making an application. Some DTPs may well have open days in the lead up to the closing date for applications; others may be happy for applicants to make informal arrangements to visit. Think about what you are interested in working on for a research degree -and not just the topic area, but perhaps also what sort of project. Laboratory based? Computational? Field based? Here you need to be able to take advice: choose a topic area that will sustain your interest, but try not to be too swayed by your (positive or negative) experience of research projects so far. Give some thought to ‘why?’ you want to do a PhD or DPhil – it will be a 3 – 4 year journey that you are embarking on, so why not think about your roadworthiness before setting off?. Think about whether the topic area seems to be ‘important’ enough to devote a large fraction of your life so far.. and why you think the problem is important enough to work on. Open ended ‘voyages of discovery’ can look very attractive at the beginning, particularly if they are tied to exotic fieldwork in a remote location, but your perspective might be very different three years in, when you are trying to work out what was the scientific rationale behind the work you have done. From the perspective of an examiner, it is surprisingly common to find that a student has worked out the ‘really obvious thing to have done’ only during the final stages of writing up the thesis, by which time there is no time or resource left. Take advice from current PhD students, and from other researchers in your own institution, to help to inform your choices of where to apply. Most importantly, keep your mind open to new opportunities. You may already be specialised in one part of a discipline, but the new DTP training structures may well offer you opportunities to move into quite new areas. Be open to opportunities in unfamiliar places: you may well believe that you are already in the best place for X (and you may be right), but don’t imagine that there aren’t excellent projects with great research groups in unexpected places – there are! Then, once you have decided to apply, give your academic referees advance notice of your plans – and make sure that you don’t pass on your own application deadlines to them! Don’t expect the application and assessment processes to be the same from one institution to the next (though they are likely to be fairly similar), and give yourself enough time to do as good a job as you can of the application. After that – good luck! It is a competitive field out there, but every DTP is on the lookout for research students with great potential. If you are fortunate enough to be made a formal offer, don’t feel obliged to accept it on the spot – particularly if you have other interviews on the horizon – and do ask for an extension if you feel that you are being asked to make a decision too quickly. A list of the centres that are offering NERC-funded studentships for 2014-2015. I am the academic lead of the Oxford Doctoral Training Partnership in Environmental Research. Ritter volcano, New Guinea, 1700. 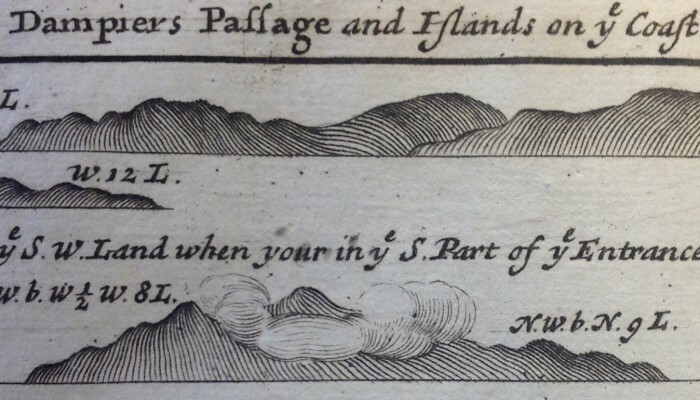 A tweet from Jenni Barclay about a Pirate Scientist gave me an excuse to visit the newly opened reading rooms in the Bodleian’s Weston Library..
William Dampier was a seventeenth century pirate, and later maritime adventurer, whose several books of ‘Voyages and Discoveries’ make for fascinating reading. 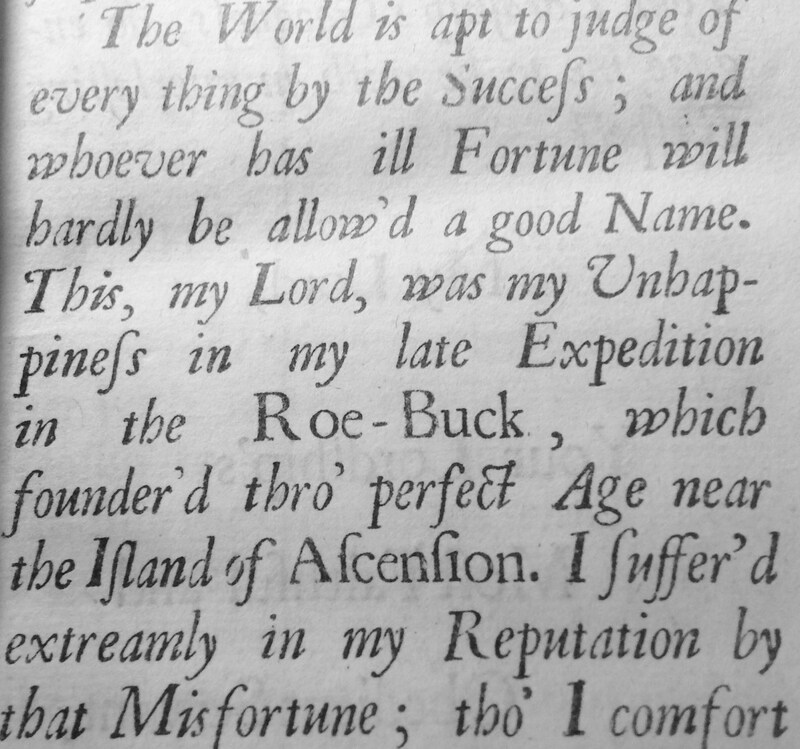 In 1699, he set sail in HMS Roebuck to try and find Terra Australis, a mythical ‘southern continent’. His journey took him past the Cape of Good Hope to the north-western coast of New Holland (now Australia), and then on to Timor, New Guinea, and New Britain. On the way back, he only got as far as Ascension island, in the Atlantic, before his ship sprung a leak and had to be abandoned. His crew were rescued some weeks later by a party of British naval ships on their way to Barbados. Despite his pessimism over the loss of the ship, and his failure to reach Terra Australis, the expedition was a great success as a ‘voyage of discovery‘. Dampier’s book has some lovely descriptions of active volcanoes that he encountered to the east of Timor island – part of what we now call the Banda Arc – and of others along the north coast of (Papua) New Guinea, part of what is now known as the Bismarck Arc. Several of his reports of volcanoes that he encountered are the earliest written records of activity. On 13 Dec 1699, the Roebuck sailed from Babao, east past Timor towards New Guinea. On December 27th ‘ we saw the burning island.. 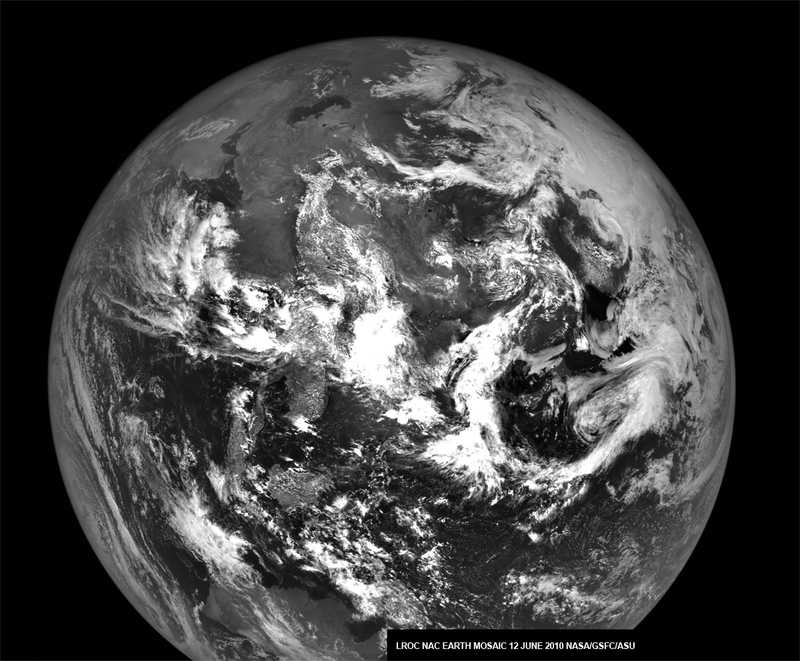 It lies in lat 6 deg 36 minutes. It is high but small. [The top] is divided in the middle into two peaks, between which issued out much smoak’. This is most likely Wurlali volcano, on Damar island, Indonesia. Later they sailed past another burning island, most likely Banda Api. Then around the northern coast of present day Papua New Guinea, they encountered several volcanoes of the New Guinea arc. 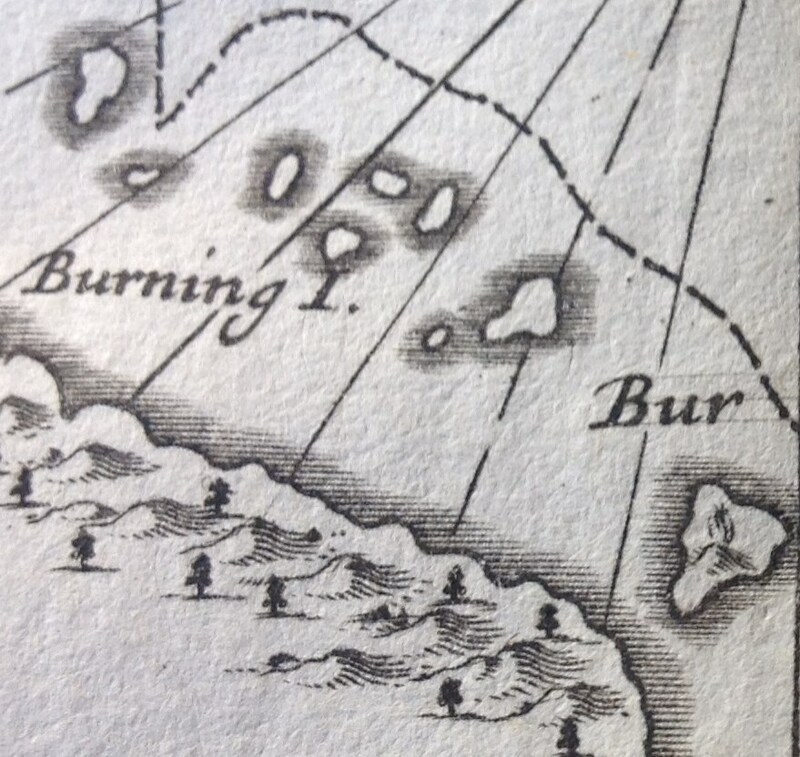 Wally Johnson has interpreted this portion of Dampier’s trip in his recent book Fire Mountains of the Islands, and identified several of Dampier’s unnamed ‘burning islands’. ‘At ten o clock I saw a great fire, blazing up in a pillar, sometimes very high for three or four minutes.. In the morning I found out that the fire we had seen was a burning island, and steered for it.’ ‘March 25th the Island all night vomited fire and smoak very amazingly and at every belch we heard a dreadful noise like thunder and saw a flame after it. The intervals between its belches were about half a minute. Some more, some less, neither were these pulses of eruptions alike, for some were but faint convulsions in comparison of the more vigorous yet even the weakest vented a great deal of fire, but the largest made a roaring noise and sent up a large flame 20 or 30 yards high, and then might be seen a great stream of fire running down to the shore‘. Little more is known of Ritter volcano until 1888, when it collapsed catastrophically in a non-eruptive submarine avalanche. There is a wonderful interactive map of Dampiers voyage in Google Maps. Wally Johnson’s Fire Mountains of the Islands (ANU Press, 2013 – available online) is a splendid resource on the volcanoes of Papua New Guinea and the Solomon islands, and their eruptive histories. There is a also a short piece on the eruption history of Ritter island in the Cooke-Ravian Volume of Volcanological Papers (editor, R. W. Johnson), Geological Survey Of Papua New Guinea Memoir 10, 115-123 (1981). Original source: William Dampier, A voyage to New Holland &c. in the year 1699. 3 volumes. 1703. [Several e-versions are available]. VolcanicDegassing is written by David Pyle , volcanologist and Professor of Earth Sciences at Oxford University. This is a blog mainly about volcanoes and volcanic activity. Some of the posts relate to David's own field work, or are related to ongoing projects in Latin America, the Caribbean, Ethiopia and Europe. Other posts relate to historical or contemporary descriptions or other representations of volcanic activity. Why does it always rain (ash) on me? The smallest volcanic island in the world? Obat kuat perkasa paling ampuh on Calbuco erupts. April 22, 2015. Obat kuat perkasa paling ampuh on Villarrica erupts. March 3, 2015, Chile.